This cassette is great. Easy to install, wide gearing range, and shifts nicely with my XT shifter and rear mech. I only wish that Shimano would sell (as a separate item) the 2-3 largest cogs on the cassette. I do a ton of climbing on my bike, and as such I tend to wear out the 2-3 largest cogs while the others remain in great condition. It's quite wasteful to have to replace the entire cassette when all I need are the 2-3 largest cogs. Anyway nothing that Merlin can do about that I suppose. It's up to Shimano. But it would be cheaper and more environmentally-friendly! It's a big improvement from the sunrace cassette I had for six months. Would recommend. I like this wide range cassette. Excellent for climbing . Best value cassette on the market! 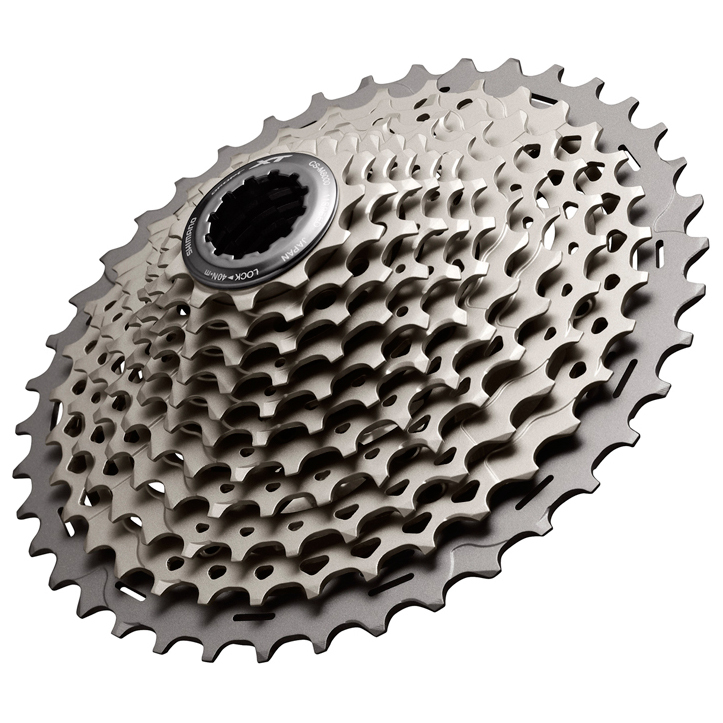 XTR cassette is lighter but doesnt last as long! Excellent quality, smoth and precise shifting and all at the right price. The days of Srams superiority are long gone. Just blows my 8spd XT away! this monster thing is lighter and more durable than my old 8spd 12-32, as well! This cassette uses two alloy spiders for the 6 biggest cogs to cut down on freehub scarring and to save weight. Shifts really good and is durable. I use connex chains without any issues. This works a treat - smooth and decisive gear changing. Delivery was good and fast. Very pleased and recommend. Very good quality sporcket, the only thing I should change is the jump between the first and second shift, because you jump from 42T to 37T. These XT components are great quality and shifting is very smooth, very happy with my changes to Shimano! Excellent cassette with good range of gears, nice shifting up and down, already have this on my bike but building up a second wheel set for different tires. Solid product, does what you need it to do at a reasonable price. A lot more reliable then SRAM. Just moved to 1x11 with a new bike and thought I'd get that extra bit of granny before racing at Glentress with the 11-46t. Easy to replace the 11-42t on my all-XT system, no other purchases necessary. Chain did not need lengthening. Shifting smooth as ever, yes a little bit of a jump in/out of the 46t but not disturbingly so, and I was very glad of that little bit easier gear. I've always been more of a spinner than a masher, and I'm sure it's better for your knees. If you pedal up steep stuff, recommended. Stepping up from an 11-42, this cassette has allowed me to go up to a 34 tooth front ring. I've got a better top end with the new gear ratio and the steep climbs are even easier. Get on it. 11-46 gives a great range for a 29er in hilly places. Works fine and the increments between sprockets are more evenly spread than a 10 speed 10-42 with expander. At last a cassette to enable proper mountain ascents, having made the transition to 1x this is a BIG help to winching my Wagon Wheeler up the Mountains. Excellent shifting with kmc chain. A little heavy but much better value to Sram equivalent level. 11-42 great with 32T chaining. Merlin are tops. Great. Who would of thought that one extra cog would make a difference? The whole 1 x 11 drivetrain shifts like a breeze and easy to get dialed. Works well on my 1x shimano cross bike build. I am using the ST-RS685 STI shifter/ brake set with an Ultegra GS RD.. all purchased from Merlin... Excellent! Oh... and I get my parts from the UK to the US in 3 days... free shipping! The west coast of the US could learn a lesson from Merlin.